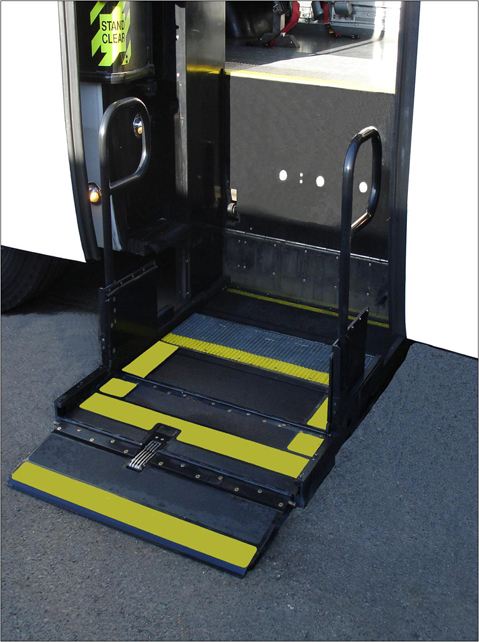 Step/Platform Lift – Lift-U | A division of Hogan Mfg., Inc. The Lift-U® model LU12 Wheelchair Lift, is our STEP / PLATFORM onboard lift. The lift can be mounted either at the front or rear door entrance. While in the stowed position, the wheelchair lift becomes the steps of the bus. When deployed, the lift extends horizontally with the steps forming the platform and lowers to ground level, or raises to bus floor level. 49″ Length between safety barriers.